Pastor Steve started here At Newport on July 1, 2018. *** See our Get Involved page for news about Be the Tool Minstries and Angel Closet! Tired? Just need a break? Looking for a weekend getaway? Rest your body and your soul in a light filled space perched on a hillside. Enjoy the warmth of friendships and the support of loving community. No need to drive for miles. 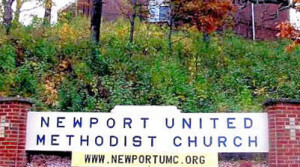 Join us at Newport United Methodist Church each Sunday morning at 9:30 am for a little retreat time close to the city. Sabbath is God’s gift to us – another reminder that we need to care for our bodies, minds, and souls with refreshment of rest and relaxation as well as a good environment and healthy food. 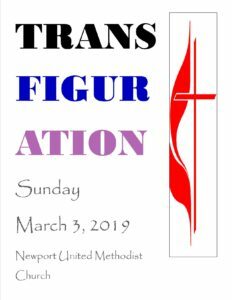 Sunday morning worship at Newport UMC is an opportunity to experience community, renewal of the soul, and time away from all the tasks and obligations that fill the other six days of the week. 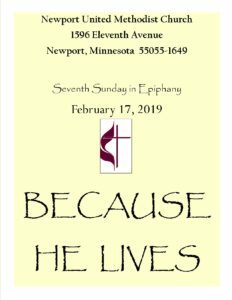 Click on the link below the image to view our latest Sunday bulletin. February 24th worship was cancelled due to weather.